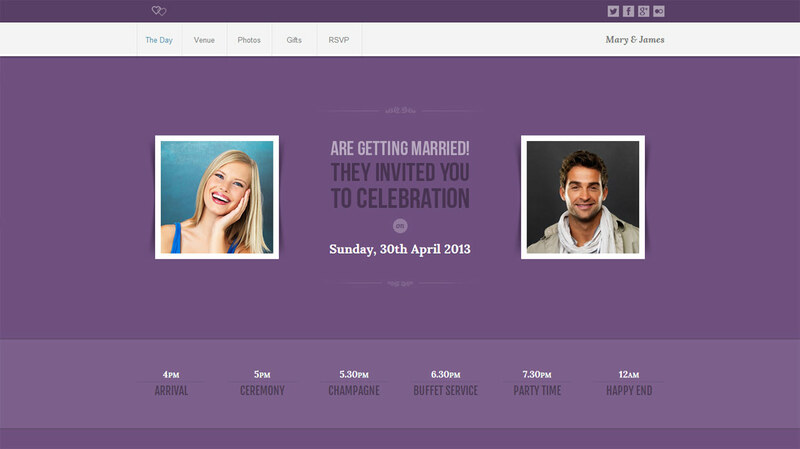 ‘Lavender’ is a basic wedding template but does a good job arranging the content and it’s responsive too. Quite like the timeline bit – clean and simple. Lavender is one page site template which is designed for weddings. If you drop some other content it can be suitable for any other purpose. It’s created using the latest HTML5 and CSS3 techniques. With a responsive design it will easily fit on any device screen and it comes in boxed and wide layout! Lavender site template works fine in all major browsers and IE8+. It’s powered by jQuery and you will notice nice page animations and discreet interactivity. Code is clearly written and there are comments for each considerable part. Php/AJAX RSVP form is included in this template, with confirmation message and Auto-reply Email. Be free to try form in live demo, your data are not saved anywhere and it’s sent to non existing email address.